Mounted atop the Blanco telescope in Chile, the Dark Energy Camera (DECam) takes very large photos of a very large object: the universe. 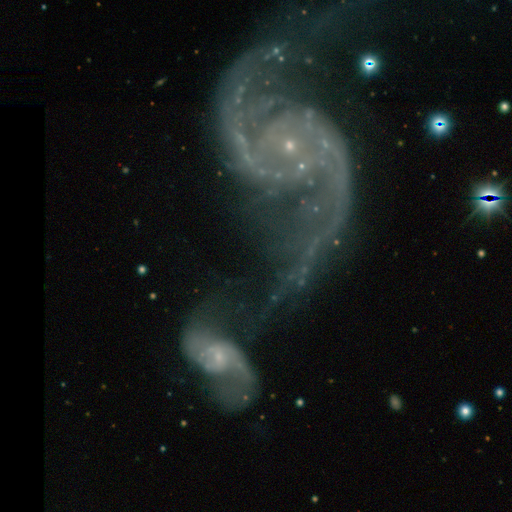 The Legacy Survey is producing an inference model catalog of the sky from a set of optical and infrared imaging data of extragalactic sky visible from the northern hemisphere. Courtesy John Moustakas and DECam Legacy Survey. Now anyone with internet access can survey the DECam images, thanks to the generosity of the scientists at the DECam Legacy Survey. Scientists recently released the first installment, about 18 terabytes of images. They will continue to release raw images the day after they are taken, with upgrades uploaded about three to six months later until the project ends in 2017. Funded in part by US Department of Energy (DOE) Office of Science, High Energy Physics Program, and the Association of Universities for Research in Astronomy (AURA) under cooperative agreement with the US National Science Foundation (NSF), the survey is tasked with creating an inference catalog of the sky. The US DOE National Energy Research Scientific Computing Center (NERSC) provides staff, computational resources, and data storage for the project that will eventually photograph and catalog about a third of the entire night sky in deep detail. Here’s the good part: You can explore the contents of the Legacy Survey viewer yourself.